Musical 'Korean Cinderella Story' to go on state in Alabama. January. 18, 2019 07:31. wizi@donga.com. Korean musical "Kongjwi and Patjwi: A Korean Cinderella Story," which is based on a traditional Korean folklore, goes on stage in Alabama in the United States. It is the first Korean musical to be shown in the southern state. According to News And Post, a local news outlet for Korean residents in Alabama, on Wednesday (local time), the Music Group Kong-Na-Mul plans to put the musical on stage at the Opelika Center for the Performing Arts in Opelika at 6:00 p.m. on Friday and at the Davis Theatre for Performing Arts Events and Concerts in Montgomery on next Saturday. The two cities are home to numerous autopart makers for Hyundai Motor Co.'s manufacturing plant in Alabama and thus have high interest in Korean culture. 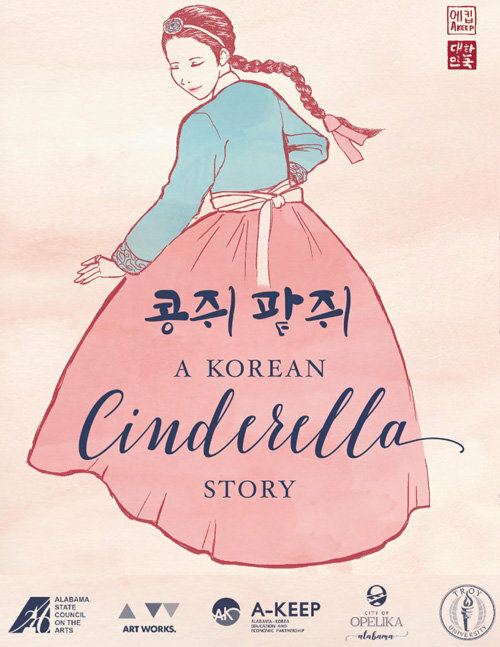 The musical is based on the eponymous Korean folklore, which shares common motifs with Cinderella. It has received audience acclaims due to its harmony of Korean traditional dance and an elegant blend of Eastern and Western musical instruments. Production director Park Gwang-tae told local daily Opelika Observer that the performance will bring an excitement through its modern use of sarcasm and comedy. While the performance is conducted in the Korean language, English subtitles will be provided. The Alabama-Korea Education and Economic Partnership, a group promoting education and economic exchanges between South Korea and Alabama, sponsors the musical as part of its Korean cultural experience program. Other sponsors include the city of Opelika, the Alabama State Council on the Arts, and Troy University at Montgomery, among others.